The government of the Kingdom of Bahrain aims to develop their national economy by attracting local and foreign investments and for this reason; they developed a new commercial register (CR) System that also known as the SIJILAT. The system launched with e-government authority in May 2015 and since then this system provides aids to complete all the business transaction by using internet services. The aim of the project is to develop a highly efficient and advanced e-based system that may provide a user-friendly interface for the licensing process of any kinds of commercial and industrial establishment. The system also links the official authorities with the procedure of issuing the license and approving the documents. This system helps the Kingdom of Bahrain to improve its ranking of business competitiveness ranks with different global indicators. 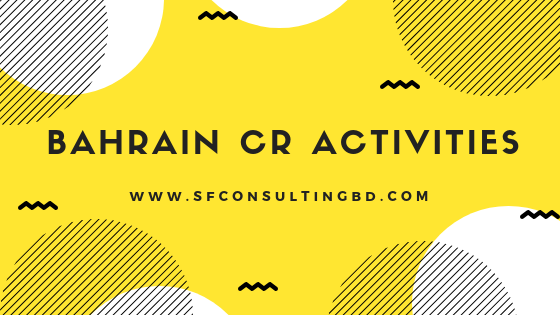 In this article, we are going to discuss the Bahrain CR activities in detail. There are a few key features of the CR system with numerous benefits in it. The major feature of the CR system is that it provides all the services in online with a single platform and manage tasks like – e applications, e application submission, booking, and reservation of commercial names online, electronic payment system, electronic notice system, getting electronic copy of certificate and also provide the verifications for the electronics transactions. This platform also connects with the e-government authority and provides e link with other ministries, make e payment to the ministries and receives e keys. Potential investors may get information from this platform and it guides the potential applicants through registration and licensing procedure for all kinds of economic activity in Bahrain. Whenever the user engages into any activity with this platform, it automatically records the activities and one may collect the default record from the platform. If the potential business requires taking permission from different ministries then the platform links the applicant with all the relevant authorities and completes the licensing procedure. The electronics system of the platform provides transparency to the overall procedure. The potential applications for commercial company registration in Bahrain have to go through a few steps for making an electronic application. The first step is to submit the application electronically or in person to the office. One may submit the application through a representative who may also be the authorized signatory with a valid power of attorney that certified by the notary public. After that, the applicant has to receive the security clearance for the foreign investors. If the enterprise does not have the final copy of the article of incorporation and the article of association then they have to attach the draft copies of the document along with capital deposit certificate. The applicant also has to attach any other documents that are required for the licensing procedure. Please note that all the attached document size must be less than 3MB size. In addition, the filed that are marked red are the mandatory fields and that must be filling with data. For any kind of electronic payment system, one has to use the Google Chrome browser. In addition, the applicant for commercial register of any kind must be renewed and valid without any exceptions. For submitting any kind of licensing application into the Kingdom of Bahrain, one should follow the required activities by using the online platform. This first activity obtained an electronic key from the e-government authority in Bahrain by registering at the site www.ekey.bh. These key needs to be obtained before making any registration application for commercial and industrial companies. The second activity is to apply for e gateway by visiting the site at www.business.gov.bh and submit all the required documents and application fees at this site. This site contains the unified directories of business activities and one has to choose the types of commercial business activity that one wishes to pursue in the future. Some commercial activities may require the legal form and for that, the potential applicants have to determine the legal form of the future enterprise. One has to fulfill all the requirements and conditions for the licensing and get the verification documents. The last step is to determine the commercial name of the business. However, there are legal restrictions applies based on the citizens of origin of the potential applicants. According to law, the citizens of GCC countries, USA have the right to apply for any types of commercial, professional, industrial and service-related activities in Bahrain. They may choose the business vehicle as a sole proprietorship or a company after the fulfillment of the requirements. On the other hand, law for the citizens of other countries either Arab or non-Arab countries may perform any kinds of economic activities by applying for commercial companies except for the specific types of business activities that banned or only reserved for the group mentioned above.